NAYPYITAW—State Counselor Daw Aung San Suu Kyi is not interested in assigning blame for the stalled peace process, Union Attorney General U Tun Tun Oo said in Naypyitaw on Thursday. “As the government [leader], chairperson of the NRPC [National Reconciliation and Peace Center] and State Counselor, [Daw Aung San Suu Kyi] doesn’t blame anyone. We take it that we are all in the same boat sailing toward peace,” said U Tun Tun Oo, who is currently acting as the government negotiator at peace talks with the Karen National Union at the NRPC in the administrative capital. It is important to make compromises to break the stalemate in the peace process, U Tun Tun Oo said. “It is completely impossible that each group can get 100 percent of their demands satisfied in political discussions. Only with mutual understanding and trust can negotiations deliver results,” he said. Though the government of the National League for Democracy (NLD) led by Daw Aung San Suu Kyi gives priority to internal peace, three years into its administration it has only been able to convince two ethnic armed groups—the New Mon State Party and the Lahu Democratic Union—to sign the Nationwide Ceasefire Agreement (NCA). The NLD-led government has also convened the 21st-Century Panglong Peace Conference to adopt fundamental principles for federalism. But it has been more than five months since the last formal Panglong discussions between the government, the Myanmar military (or Tatmadaw) and NCA signatories took place. Meanwhile, the meetings of the Union Peace Dialogue Joint Committee (UPDJC), Joint Implementation Coordination Meeting on the NCA (JICM) and Joint Monitoring Committee (JMC) have also been suspended. 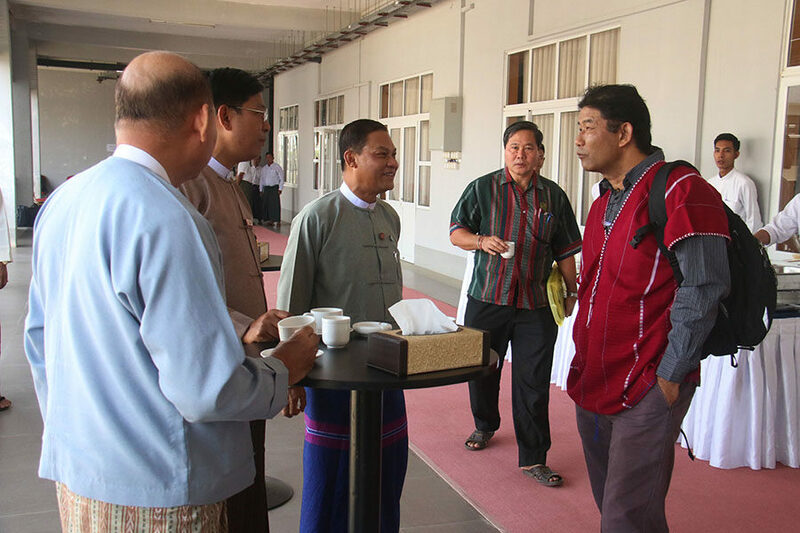 The government has been holding informal talks with individual NCA signatories in order to re-start political talks, which is one of the reasons the KNU delegation was in Naypyitaw on Thursday to meet government negotiators. There have been problems with interpretation of the terminology in the NCA, said KNU secretary-general Padoh Saw Ta Doh Moo at the meeting on Thursday. “I suggest it is time we think about how we can narrow the differences between us that have existed since before the third session of the Panglong Conference, so that we can find common ground to move forward,” he said at the meeting. U Tun Tun Oo called for collaborative efforts in addressing the challenges facing each group. “The government really wants to start official talks as soon as possible. And I’d like to say seriously that the government is ready to cooperate to resolve the problems obstructing the talks,” he said. While the Tatmadaw’s four-month unilateral ceasefire will come to an end on April 30, there has been little progress in talks with the NCA non-signatories to sign the pact. At a press conference on March 25, the Myanmar military’s Major-General Soe Naing Oo said the Tatmadaw would not extend the truce, as four months should be enough to move the peace process forward. The government and Tatmadaw are set to meet the Kachin Independence Army before and after the Thingyan Festival in April. But with Thingyan falling on Saturday, the two sides are likely to meet after Thingyan at the earliest. The government and Tatmadaw are also set to meet the Restoration Council of Shan State and Shan State Progress Party to discuss resettlement of internally displaced persons in Kyaukme and Hsipaw, and the deployment of troops.